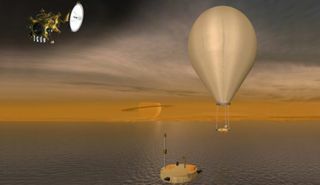 An artist concept of proposed mission to the Saturn system, the Titan Saturn System Mission, which includes a mothership, lake lander and a balloon probe. One of NASA's next great adventures could take place with araindrop-flecked camera bobbing around on extraterrestrial waves. Or at least,that's the hope of several researchers who want to sail an unmanned,nuclear-powered capsule on Saturn's moon Titan. Titan eerily resemblesEarth with characteristics such as wind, rain and lakes, but all within thebounds of a frigid environment where methane and ethane replace liquid water. Themany lakes dotting the moon's surface suggested an alternative mission proposalcompared to the usual rovers and hard surface landers that NASA has sent toother destinations. "We got funded to look at the possibility of sending a lake lander toTitan," said Ellen Stofan, a geologist with Proxemy Research in Maryland. "Scientifically,it's sort of a beyond obvious thing to do." The concept may hold water as far as tickling scientific fancy, but muststill await final selection for one of NASA's upcomingDiscovery missions. But it may receive a technical boost from the spaceagency's development of a more powerful nuclear generator in recent years. A lake lander forms part of NASA?s proposed Titan Saturn System Mission,an ambitious plan to send three probes ? including a balloon-mounted vehicle and anorbiter ? to explore the cloudy Saturnian moon. Titan practically beckons to a boat-shaped mission with the many lakescrowding its northern hemisphere. Average temperatures hover around -292degrees Fahrenheit (-180 Celsius), and create weather patterns such as methanedrizzling down from the clouds into liquid ethane lakes. The moon's only previous visitor came when NASA's Cassini spacecraftdropped Europe's Huygens probe in 2005. Huygens' successful parachutelanding raises hopes that a future mission could manage the feat again. "It's very cold, but the technological challenges aren't as big asyou might think," Stofan told SPACE.com. "Landing in liquid isa lot more forgiving than on land." A successful splashdown requires a good lake target. Many of Titan'sthousands of lakes reach lengths of just several kilometers, but two of thelargest northern lakes extend hundreds of kilometers and compare in size to theNorth American Great Lakes or Europe's Black Sea. Both Ligeia Mare and KrakenMare represent "targets we can hit with high confidence," Stofansaid. Titan's thick atmosphere also makes descent and landing slightly easierfor would-be landers compared to the thinner atmosphere of Mars. And a Titanmission may also prove less technically challenging than the unprecedented stepof putting landers or submersibledrones on Jupiter's icy moon of Europa. The Titan lake lander already has a long list of scientific goals beyondsnapping images of lake and sky. Stofan hopes the mission can measure thechemical composition of the lake, gauge lake depth, and study thelake-to-atmosphere cycle of exchanging organic material. Sonar could also helpcreate a profile of the lake bottom. All the necessary instruments require power, and Stofan says thatnuclear generators represent the most practical option. Titan's thickatmosphere rules out solar panels that have kept Mars roversand landers alive for years, while batteries would only provide some hours oflife at most. NASA recently approved Advanced Stirling Radioisotope Generators (ASRGs)for use on the Discovery missions. The new radioisotope generators are notunlike earlier generation models that powered Cassini and other spacecraft byusing the heat from radioactive decay, rather than actually using nuclearfission. But the ASRGs take advantage of the heat to power a piston andgenerate electricity, and use just a quarter of the plutonium normally required. "ASRGs takes the mission from a type of grab science to answeringdeeper questions," Stofan noted. Stofan has already teamed up with the Applied Physics Lab at Johns HopkinsUniversity to shepherd the lake lander through proposal phases. Now theresearchers must await a possible year-end announcement of the final selectionsfor NASA's Discovery missions. If the lake lander does someday splash down on Titan, its mast wouldhold a camera as opposed to a sail. But a stiff wind and currents would stillpush the floating capsule around for months, and help convey an oddly familiarsight on an alien world, mission planners have said.